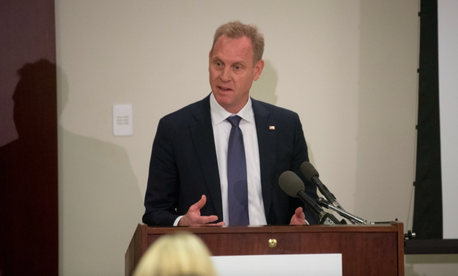 The U.S. military will indeed be affected by a 5-percent cut in federal spending ordered by President Trump at a cabinet meeting last week, Deputy Defense Secretary Patrick Shanahan said Friday. “We will do as directed by the president and give him a $700 billion budget and then everybody gets to decide how to work with that,” Shanahan said Friday at the Military Reporters and Editors Conference in Arlington, Virginia. Since that $700 billion includes the Energy Department’s nuclear funding, as is customary, it heralds a dip from 2019’s budget of $716 billion and a planned $733 billion for 2020. But defense budget experts put little stock in that number, which they called just an opening salvo in the battle over the next budget. Between now and December, Pentagon officials will negotiate with White House budget officials about the size of the defense budget proposal, which is usually sent to Congress in early February. Indeed, Shanahan said DoD planners would continue work on their $733 billion budget, even as they began to work up a $700 billion version. “We are not going to reverse course on all of that planning,” said Shanahan, alluding to the months of work already completed by military budgeteers. The two budgets will give Defense Secretary Jim Mattis “a clear understanding of what the tradeoffs are,” he said. Many parts of the Defense Department’s 2020 spending plan are already locked in, such as servicemembers’ pay and benefits. Any budget cuts will likely fall on weapons procurement and research-and-development initiatives. Beyond the Pentagon-White House battle, the 2020 defense budget faces several political wildcards. For one, federal spending caps, sometimes called sequestration, are set to return in 2020 and 2021, unless Congress passes legislation to remove them. Next month’s midterm elections will also shape federal spending. “If the Democrats take the House … then what we can foresee is a mighty negotiation over a very long period of time between the White House, the Republicans in the Senate and the Democrats, if they win the House,” Adams said. Republicans have historically tried to offset defense spending increases by cuts to other domestic spending, such as social security programs. Democrats have been open to defense spending increases as long as domestic spending gets an equal boost.